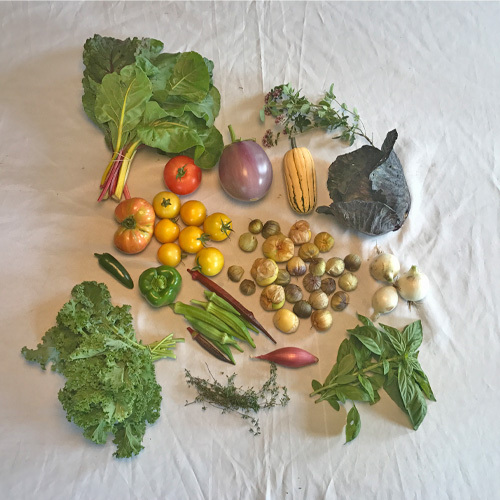 Our tomatillo crop has begun to produce in abundance so we were able to include a quart of mixed varieties. Tomatillos are related to ground cherries, another crop we love which has had a slow start this season, both of which are in the tomato plant family. 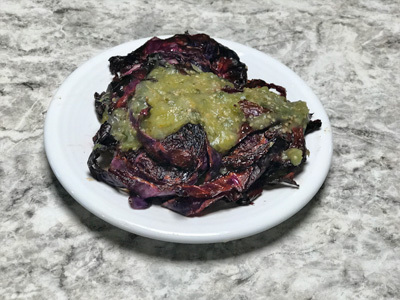 Tomatillos are best when cooked into a salsa verde (recipe below), which works well with many foods, from quesadillos to chips to rice to chicken. Preheat oven to 425 degrees F. Slice cabbage width-wise, then coat with 1-2 tbsp of olive oil and a pinch of salt. Roast the cabbage for about 45 minutes in the oven, or until tender but not overly charred. To make salsa verde- Roughly chop 1 quart of tomatillos with the husks removed and rinsed. Dice 3/4 of 1 jalapeno pepper. Finely dice 1 white onion and add to a saute pan over medium high heat with 1-2 tbsp of olive oil. Add diced jalapeno and saute for another few minutes. Add chopped tomatillos, 2 tbsp of finely chopped oregano, 1/2 tsp of ground cumin, 1 tsp of salt, and 1 cup of water. Bring to a boil over high heat, then reduce the temperature and cook for 15-20 minutes, adding more water if the pan becomes too dry. Blend the mixture until smooth. Serve the cabbage with the salsa verde spooned overtop. Preheat oven to 375 degrees F. Slice eggplant widthwise into dics. In a colander toss eggplant with a few tsp of salt to coat, and allow the eggplant to sit for 30 minutes. This will cause the eggplant to shed water. Slice the beefsteak tomatoes widthwise, and slice a white onion widthwise into strips. Layer the tomatoes, eggplant, and onions in a baking dish. Sprinkle finely chopped basil throughout the layers. Add 4 tbsp of butter to the top of the layers before adding the oven and baking for about 20 minutes. Remove baking dish from the oven and add several ounces of mozzarella cheese, either several 1/4 inch slices or about 1/2 cup shredded, and then a handful of Parmesan cheese. Bake another 10 minutes, or until the cheese is bubbly. Soak 1 cup of white beans overnight, or pre-boil the beans for 1 hour before rinsing. Preheat oven to 425 degrees F. Slice 7 yellow cocktail tomatoes in half and remove the tough core. Slice 1 medium white onion into 3/4 inch chunks. Toss the tomatoes and onion with 1-2 tbsp of olive oil and salt. Add coated tomatoes and onions to a baking dish and cook for 45-60 minutes, removing the onions at 45 minutes or before they become too charred. Remove the tomatoes and onions from the oven, roughly chop the tomatoes into 1/2 inch chunks, and set aside. In a saucepan add cooked white beans, 1 tbsp of finely chopped thyme, and 1/4 cup of water. 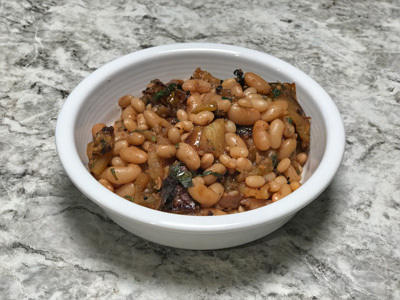 Cook beans until water has evaporated, then add roasted tomatoes and onions. 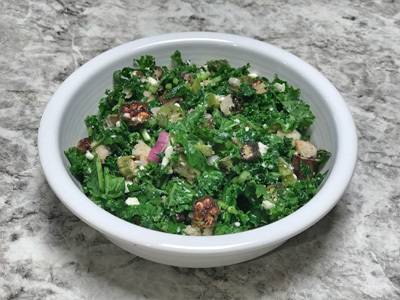 Dress the salad with a balsamic vinaigrette- mix together 1 tbsp of balsamic vinegar, 3 tbsp of olive oil, 1/2 tsp of salt, and a dash of ground black pepper. Preheat oven to 425 degrees F. Slice okra widthwise into 1/4th inch discs. Coat okra with 1-2 tbsp of olive oil and salt. Roast for about 45 minutes or until okra is crispy but not charred. Remove from oven and allow to cool. Chop kale into thin ribbons, then massage the greens until they are tender. 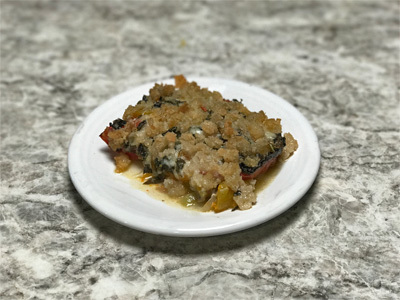 Add to a mixing bowl and combine with crispy okra, 1/4 cup of grated Parmesan cheese, 1/2 finely diced red scallion, and coat with a lemon-honey dressing. Lemon-honey dressing: mix 2 tbsp of fresh squeezed lemon juice with 1 tbsp of honey, 2 tbsp of olive oil, and a pinch of salt and pepper. Preheat oven to 425 degrees F. Skin the delicata squash (preheating in the microwave for 1 minute makes peeling easier), then remove the seeds and core. Chop the squash into 1/2 inch cubes. Coat with 1-2 tbsp of olive oil, a pinch of salt, and a tablespoon of thyme then roast in the oven for about 30 minutes, or until flesh is tender and roasted. Cook 3/4 cup of red rice in boiling water for 15-20 minutes, or until tender. In a large skillet add 2 tbsp of olive oil and 1/2 of a finely diced shallot. Saute for several minutes then add 1 diced green pepper, and 1/4 of a diced jalapeno pepper, and continue to saute. Chop Swiss chard greens into 1/2 inch ribbons and add to the saute pan with 1/4 cup of water. Cook greens until tender. 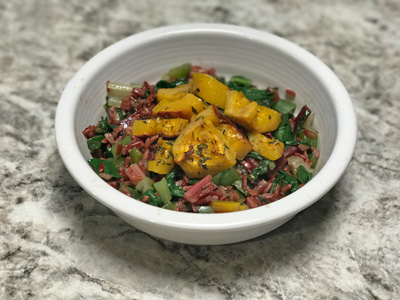 Combine rice with sauteed greens and roasted squash. Dress dish with 2-4 tbsp of lemon juice and 1 tsp of salt.